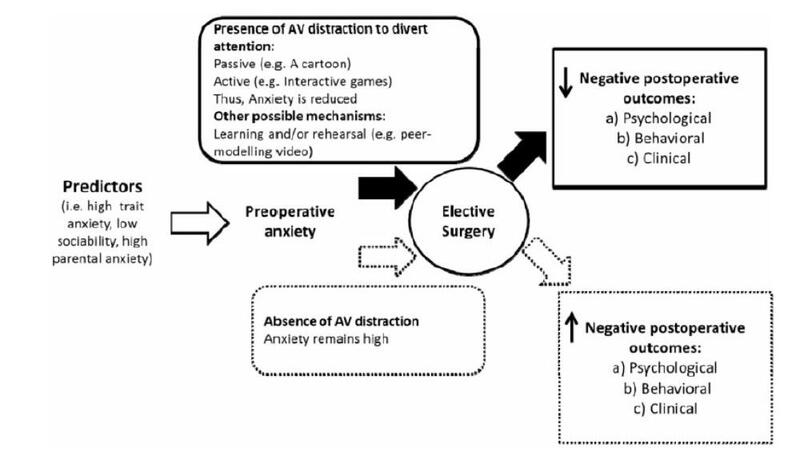 The objective of this study is to examine the effectiveness of Audiovisual (AV) interventions at reducing preoperative anxiety and its associated outcomes in children undergoing elective surgery. cost-effectiveness. We also assessed the risk of bias of each study. Our results identified a total of 18 studies. We took a meta-analytic approach and narrative synthesis of findings to summarize the results of the studies. Overall, there was a -11.4 point WMD (95% CI=" -17.29" to -5.59, p<0.01) between anxiety scores in AV interventions and control groups. This suggests that AV interventions resulted in statistically significant reductions in preoperative anxiety in children. Seven of nine studies using videos reported positive effects in reducing anxiety. Similarly, five studies using multi-facets preparation preoperative program reported significant reductions in preoperative anxiety in children. However, not all AV interventions can reduce pre-operative anxiety in children. Two studies compared playing interactive video games with other interventions and found that interactive music therapy and Internet preparation programs did not effectively reduce preoperative anxiety in children undergoing elective surgeries. In conclusion, this systematic review suggests that AV interventions can be effective in reducing children’s preoperative anxiety. Videos, multi-faceted programs, and interactive games appear to be the most effective, whereas music therapy and Internet programs are less effective. While AV interventions are potentially useful, adequately powered RCTs are required to conclusively pinpoint the components and mechanisms of the most effective AV interventions and guide practice. Chow, C., Van Lieshout, R.J., Schmidt, L.A., Buckley, N. (2015). Audio-Visual interventions for reducing preoperative anxiety in children undergoing elective surgery: A Systematic Review. J Pediatric Psychology, 41(2):182-203.